OpenGov recently got the chance to catch up with Lee Caswell and Rick Scurfield of NetApp to get their input on the IT trends and happenings within NetApp. Lee Caswell is the Vice President of Products, Solution, and Services Marketing at NetApp. He leads a team that speeds the customer adoption of new products, partnerships, and integrations. Lee joined NetApp in 2014 and has extensive experience in executive leadership within the storage, flash and virtualization markets. Rick Scurfield is the APAC President for NetApp. Rick is responsible for leading and growing the business across the region, including driving the channel strategy, managing strategic partnerships, and developing the company’s emerging products business. We asked the two of them some questions to get their insight on what 2016 will bring to the IT industry. What kind of advice would you give to organisations who are still hesitant to move to the cloud due to security concerns? Lee Caswell: When we talk about security, the trade offs really have to do with sovereignty rather than security. Sovereignty is the idea that it matters where your data is located rather than who owns it. This is why we should look from a data governance standpoint and say ‘Let me go and characterize the data that I have and put a layer of sensitivity on it. There is a second standpoint that deals with performance. It is not only security or sovereignty that drives where you locate your data. Increasingly, flash gives you the opportunity to increase performance that leads a company to better decision making. We live in a society that is increasingly impatient, looking for information online, not waiting too long and make decisions based on the information that is given to them. It is possible to deliver a lot of performance from on-premises gear. We see organisations take a hard look at investing in flash to deliver real-time performance results in their on-premises performance gear, and then accessing the cloud for things that are less performance sensitive. Rick Scurfield: We recognise that security concerns increase as government organisations strive to improve their service levels to the public through new investments in the area of cloud platforms. In this quest for service excellence, the process of self-assessment requires organisations to match expectations of the populace with an appropriate cloud model while adopting policies and procedures to mitigate security breaches if it happens. For some services, organisations may choose to deploy a hybrid cloud model to keep data on-premises while providing an ongoing option to scale to a public cloud. This will provide organisations with a phased and flexible approach in rolling out new services while providing them with choice and control of their data regardless of where their data resides. 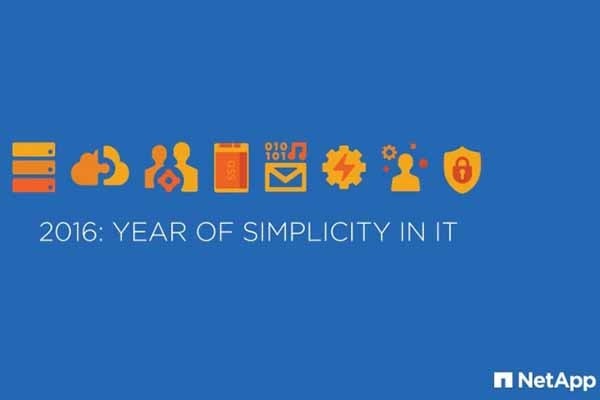 If this will be the year of simplicity in IT, how does this transform the role of IT department staff? Lee Caswell: Twofold things are happening, one is that they are getting more demands put on them and secondly, their resources are being cut. Our take is that the IT staff are looking at how to simplify the drudgery work that they are doing, whether it was configuring systems, managing performance, or even replacing disk drives. Even on converged infrastructure, the idea that we have prequalified systems that would have compute, network, and storage all together. We are finding IT departments looking for prequalified platforms where they can put systems in place much more quickly, than they historically could do. And that if there are support issues, they have single support arms that they could talk to. This allows them more time to focus on new DevOps models, as agile development allows things to move very quickly. Rick Scurfield: The role of departmental IT will transform as users become empowered through the consumerisation of IT and also the emergence of shadow IT. Through simplification of IT, IT departments can now free up time for higher-value added activities and not be confined to performing tasks to keep the “lights on”. We have seen governments rush to consolidate their own services to help end users, in this process are there certain steps you would suggest be taken to ensure that service delivery is clear and consistent? Lee Caswell: A lot of governments now are looking to bring in new data sources, like IoT. All of the sudden we have a lot of data sources coming in from a lot of places. Organisations must figure out how to access this data in a common and consistent format. We need to decide how do we get access to the right data at the right time. What you find is that there is not one common repository for data. The advice is that people go and look for ways to go and integrate access to that data, management, and then moving that data. Now we have data that is all over and we have to keep thinking how do we manage it. This is driving governments to start looking beyond a single platform focus. They want to leverage the same management across different storage media types, whether flash, disk or cloud. Even across similar platform types. We must think how we get leverage and scale when the number of data sources are exploding. Rick Scurfield: Governments can ensure that services are delivered using tested and validated methodologies and leveraging implementation best practices. These aim to minimise risk and ensure a consistent and predictable outcome based on the key metrics outlined by the organisation. What do you mean by &apos;new&apos; hybrid cloud use cases? Lee Caswell: When you think about what the cloud is, there was this first wave of unbridled enthusiasm. Then, you had a backlash from companies and governments who said, ‘I am not putting all of my data in the cloud quite yet’. Then you saw a strong desire to go integrate the worlds of on-premises infrastructure with what’s happening in the cloud. We believe that the hybrid cloud, the idea that data will be moving back and forth between these two worlds, is the future going forward. The ‘new’ hybrid cloud use cases have to do with all of the choices that you never had before. For example, if you want to run or develop a new application, you might go and develop that in the cloud. You might have a bunch of developers and not want to buy them new systems. Since you are not running on any mission-critical data at that point, and just developing, it works. When you finish the development and you want it to run fast and secure, so then you bring that application to dedicated hardware on premises. You have this application life cycle that is evolving, where something is born in the cloud then you bring it to on-premises hardware to run it, then you may back it up in another location. The idea that data now is moving seamlessly across cloud and on-premises boundaries, is a pretty new way to think about this. Rick Scurfield: By having an integrated solution across private, hyper-scale and co-location cloud models, organisations are able to take the opportunity to modernise their data center, transform the way their data backup & recovery is done today and also accelerate their enterprise applications using new technologies, such as performance-based flash arrays capable of performing in a clustered and non-disruptive environment. In your own words, how do your solutions support Smart Nation / Smart Cities initiatives? Lee Caswell: When we look at smart nations and smart cities, there is a prevalence of technology and driving new social, mobile, connected users in more distributed environements, with new source elements like surveillance cameras, security systems, to border control. All of these systems in a smart city are becoming interconnected to the point that data needs to be managed, connected, and needs to move. Smart City initiatives start off with the idea that there should be interoperability at the system level, but you can share information between devices. Data fabric is complementary to a smart city initiative in making sure data have a consistent format, it is able to be efficiently shared, and that all of this happens within a software defined area. Rick Scurfield: To deliver on Smart City initiatives, government agencies are digitally connecting infrastructures by building a robust IT and communications infrastructure around the world in collaboration with the private sector, thus creating an open data ecosystem. Additionally, sensor-driven applications are enabling the digital transformations of businesses and public services, with data being generated at an explosive rate. However, data is increasingly stored in isolated, incompatible data silos across disparate environments. This prevents companies and governments from realising the full potential of data in APAC just like anywhere else, by limiting choice of IT infrastructure, increasing cost, and impeding responsiveness – thus driving a need for better data management systems. NetApp is meeting that demand by enabling organisations to seamlessly connect different data management environments into a cohesive, integrated whole. Our Data Fabric vision makes it possible for organisations to innovate faster by being able to access and manage their data freely with fewer resources. NetApp also has a strong partnership with leading technology companies worldwide. We support our partners with data management solutions that meet the requirements of Smart City initiatives.